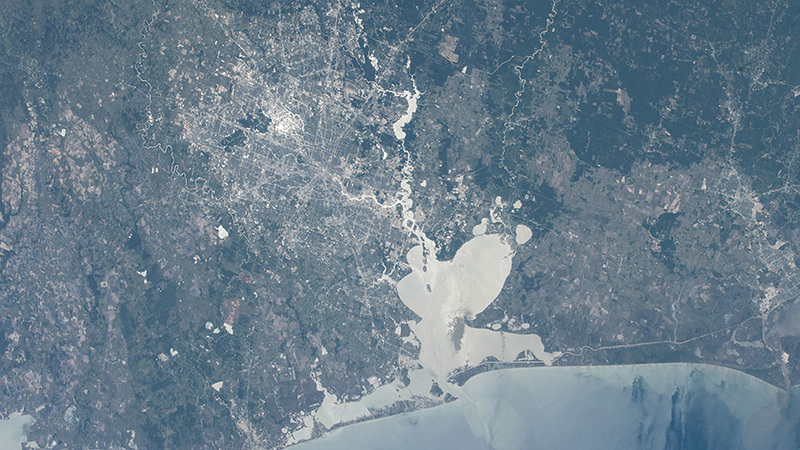 Houston, Texas, the home of NASA’s Johnson Space Center, and Galveston Bay are pictured from the space station at an altitude of about 250 miles. Robotics controllers and Expedition 55 crew members are getting ready for the departure of the SpaceX Dragon resupply ship next week. The commercial space freighter will leave the International Space Station and splashdown in the Pacific Ocean on Wednesday loaded with cargo for retrieval and analysis. Flight Engineer Ricky Arnold powered up command and communications gear today that will aid the crew when Dragon departs the station on Wednesday at 10:22 a.m. EDT. NASA TV will begin its live coverage of the departure activities at 10 a.m. Dragon will splashdown in the Pacific Ocean about six hours later to be recovered by SpaceX and NASA personnel. The splashdown off the southern coast of California will not be seen on NASA TV. The Canadarm2 will be remotely maneuvered today to grapple Dragon today while it is still attached to the Harmony module. In the meantime the 57.7-foot-long robotic arm and its fine-tuned robotic hand, also known as Dextre, are completing the installation of an external materials exposure experiment outside of Japan’s Kibo laboratory module. Astronauts Drew Feustel and Scott Tingle are still packing Dragon today with a variety of cargo including space station hardware and research samples. The STaARS-1 experiment facility has completed a year of operations at the station and is being readied for its return aboard Dragon next week. The research device supported observations of living systems exposed to simulated gravity such as Earth, the Moon and Mars. Feustel also stowed faulty life support gear in Dragon for refurbishment back on Earth. If you hear something really incredible and try to wrap your head around it, but it only goes so far, is the Speed the iss travels. Im to understand 4.76mps.Thats miles per second,right? We all know miles per hour, but can only imagine 5 miles a second. 25 miles in 5 seconds, 50miles in 10 seconds, 20 seconds? 100 miles etc….WOW, Remarkable…….keep it flying, from a station watcher, in Alexandria La. ✌out…..